Larry Krasner will face the lone Republican candidate, Beth Grossman, in the fall. Civil rights lawyer Larry Krasner won the Democratic nomination for Philadelphia's District Attorney Tuesday night. 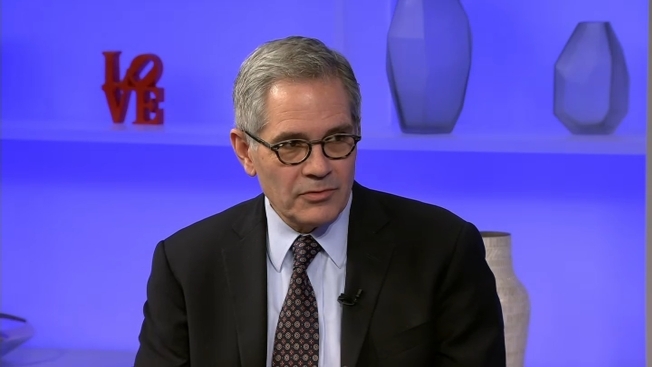 NBC10 spoke with Krasner after the win. A civil rights lawyer poised to become Philadelphia's next district attorney reached out to reassure office prosecutors about his agenda after winning the all-important Democratic primary. Larry Krasner has never worked as a prosecutor and has instead defended Black Lives Matter and Occupy Philadelphia protesters. He benefited from a $1.5 million donation from liberal billionaire George Soros to an independent political action committee that ran commercials and sent out canvassers in support of his candidacy. He hopes to succeed two-term Democratic incumbent Seth Williams, who goes on trial next month in a federal bribery case. Krasner, 53, strongly opposes mass incarceration and the death penalty. He has said that none of his clients have been sent to death row in 25 years of defending capital cases. Pennsylvania under Democratic Gov. Tom Wolf has a moratorium on executions but prosecutors can still pursue death sentences. "Tonight was not about a campaign or a particular person. It was about a vision," Krasner said in statement. "A vision of a criminal justice system that works for everyone. A society that builds people up instead of tearing them down." At a rally after his victory, he tried to assure the office's 600-person staff, about half of them lawyers, that he shares their commitment to seeking justice. Krasner pulled ahead in a crowded field to win the Democratic nomination Tuesday over several veteran prosecutors and a former city manager. He will face the only Republican candidate, Beth Grossman, in the fall. The victory followed an intriguing campaign as eight newcomers vied for a job that helps shape city policy on sanctuary cities, police use of force, prison reform and other national issues. The candidates included a Pakistani-American, a Cuban-American, a black Muslim and Krasner, who also got a nod from singer-songwriter John Legend, a graduate of the University of Pennsylvania. Several candidates supported prison and bail reform and prisoner re-entry programs, despite efforts under U.S. Attorney General Jeff Sessions to return to the era of long prison terms for drugs and other crimes. The political action arm of Color of Change, an online racial justice group, sent out 200,000 texts to black city voters and called Krasner's win "a victory for all Americans resisting the Trump Administration's backwards criminal justice policies." The other Democrats included Joe Khan, a former city and federal prosecutor; Rich Negrin, a former city prosecutor and city managing director; and Tariq El-Shabazz, who did a stint as Williams' top assistant. In the city controller's race, Rebecca Rhynhart defeated incumbent Alan Butkovitz for the Democratic nomination.